We are celebrating Eric Carle's birthday this week! One of the Lil Diva's favorite books is Eric Carle's Little Cloud - Draw-it-with-Chalk Book. They enjoy adding their own illustrations to the story so I knew they would enjoy making their own Puffy Paint Cloud Art. 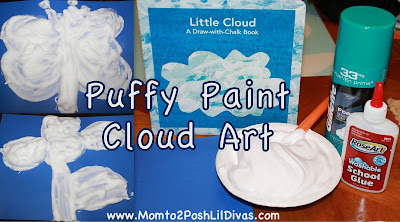 Making this type of puffy paint is super easy - just mix glue and shaving cream. I don't measure but the trick is to make sure it's still nice and fluffy so you still get a nice puffy picture after it dries. 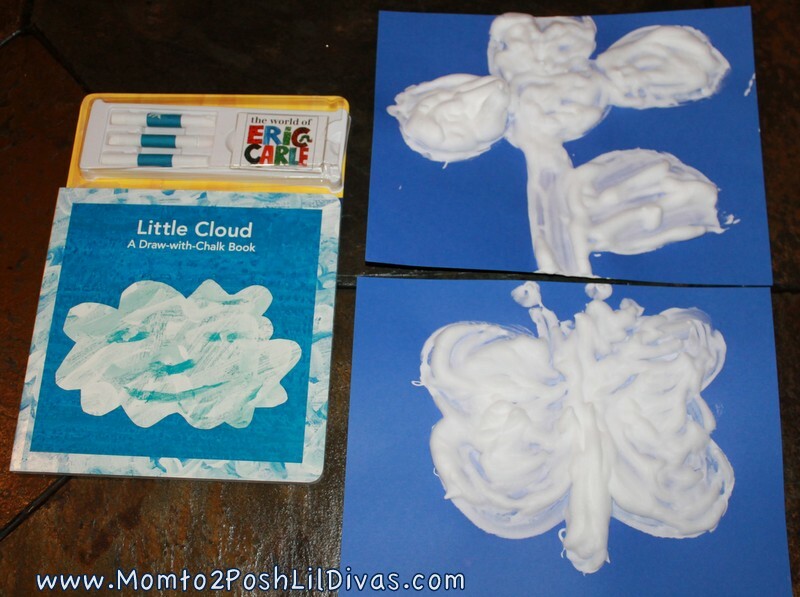 The Lil Divas made butterfly and flower clouds. Then of course they wanted to play with shaving cream. That's a cool way to do puffy paint! This looks like a fun activity to do! JDaniel would love all the cream on his hands.